Our home has been invaded by ants!! The more we do to try to get rid of them, the more persistent they are in coming back! I decided that we could learn a lot from these little guys. I had the kids list their observations about the characteristics of ants. We then talked about our purpose and what we should be working hard at. We listed things like: Bible Study, Prayer, School Work, Cleaning up after oneself. We read the scriptures Prov. 30:25 and Prov. 6:6. 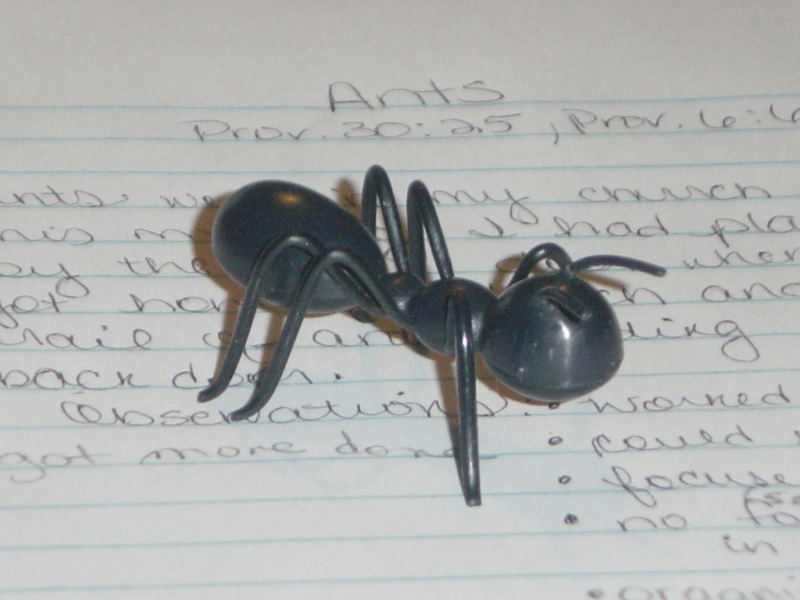 We displayed these plastic ants on our table and in the kitchen window all week to remind us to “consider the ants.” These were on a watermelon-themed cake purchased from Walmart for a birthday party (you may be able to ask them if you can purchase them separately). We’ve been so fascinated by the ants that we are doing our Science Fair project on what foods attract ants. We’ll try to come back and post our finding under the Category-Homeschooling when we are finished. We were going to do our project on repellents, but changed our minds. We found that ground cinnamon worked great at covering up the pheromones!